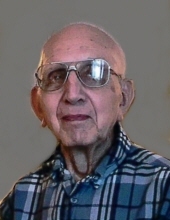 ARTHUR VAN ZUIDEN, 91, of Camanche, IA, died Sunday, March 17, 2019, at The Alverno Health Care Facility in Clinton, IA. His funeral service will be 11:30 AM Thursday, March 21, 2019, at Community Reformed Church in Clinton, IA preceded by visitation from 9:30 AM until the time of the service. Rev. Bob Hoffman will be officiating. The Fulton Chapel of the Bosma-Renkes Funeral Home is in charge of arrangements. Graveside service will be at 1:30 PM Thursday, March 21, 2019 at Rose Hill Cemetery in Camanche. A memorial has been established to Community Reformed Church. Arthur was born October 21, 1927, in Erie, IL, to Frank J. and Gertrude (Feldt) Van Zuiden. Art was educated in the Newton Township grade schools and was a graduate of Erie High School. He married Vivian M. Hoogheem on November 6, 1953, in Fulton, IL. Art was employed as a millwright at J.I. Case in Bettendorf, IA. He then retired from National By-Products in Clinton, IA, where he was supervisor. In 1977, Art established the East Iowa Auto Speed Shop in Clinton. He was a member of Community Reformed Church in Clinton. Art was heavily involved with stock car racing his whole life. He enjoyed the outdoors. Survivors include his wife, Vivian; one daughter, Kim (Robert) Wilson of Camanche, IA; two sons, Keith Van Zuiden and Kelly (Tammy) Van Zuiden both of Clinton, IA; one daughter-in-law, Nancy Van Zuiden of Fulton, IL; five grandchildren, Erin (Mike) Wenzel, Kane (Alicia) Van Zuiden, Joseph (Mandie) Fahlbeck, Spencer Hume, and Casey Slade; eight great-grandchildren. He was preceded in death by one son, Kevin L. Van Zuiden. To send flowers or a remembrance gift to the family of Arthur Van Zuiden, please visit our Tribute Store. "Email Address" would like to share the life celebration of Arthur Van Zuiden. Click on the "link" to go to share a favorite memory or leave a condolence message for the family.